My boys are often done their schoolwork by lunchtime. They are left with a lot of free time to fill before I allow them to turn on video games or start watching movies and TV. I've noticed as my boys age away from playing with toys it's getting a bit harder for them to fill those hours of free time. Especially when they do not have just one or two things they're passionate about. I decided to start brainstorming ideas for some hobbies they might enjoy and could use to play around with; I started with a list of activities they have shown some interest in before and branched out from there. I was also trying to think of ideas that going forward, we could use for high school credits or that might lead into a job field or area of study. Here are just a few ideas for some new hobbies they might enjoy! 1. 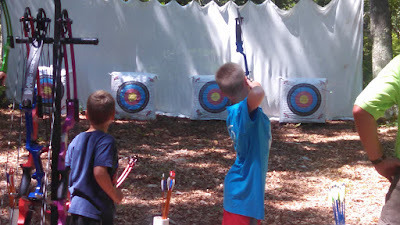 Target practice using bows or air soft guns. 2. Basic Carpentry. My boys have so much fun making woodworking project with their dad (like Alec with his cat dish) and I thought they might enjoy playing around with hand tools and doing some simple woodworking. Ian has already spent a bit of time this winter making his own truck garage from scraps of wood he found around the house and hand tools. All the boys have been designing weapons and cutting them out with my husband's help. 3. Photography. Alec, in particular, loves to wander around outside (when the weather is nice) and since he is drawn to nature and to the arts I thought he might enjoy playing around with taking some photographs. We've played around a bit with photography this year and he's taken some pretty neat shots. 4. Painting in all it's forms! We have a lot of art supplies and I hope to encourage all of the boys to use them more for fun and exploration. 5. Wood Burning; this kind of goes hand in hand with the carpentry but we have a woodworking tool and the boys have had great fun making projects with it in the past. 6. Science kits while educational are also great fun! I don't mind purchasing a few kits now and then to keep the boys busy and learning; especially if it becomes a passion of theirs. There are so many science kits to choose from too! 7. Lego Architecture sets. My boys love Legos and the architecture sets are just a bit more challenging. I thought they might enjoy putting together different types of Lego sets than we have used previously. Bringing famous buildings into real life would also give us a chance to study them up close. 8. Film Study-- all of my boys enjoy watching movies and with the help of a Film Study journal, watching movies could easily become a great self- guided learning opportunity for the afternoon. I'm particularly interested in getting them to watch historical fiction or science/ science fiction type movies. 9. Cooking/ Baking. My boys enjoy being in the kitchen and helping out but rarely think to fill their afternoon hours baking or cooking. Alec has recently started watching Cupcake Wars and has shown an interest in learning to make different types and flavors of cupcakes. 10. Computer Coding. My boys love playing video games and often come up with new ideas or new ways to improve upon existing video games. They took a couple of basic computer coding classes from the Microsoft store at the mall and would love to develop their own mods. I thought computer coding might be a fun way to pass the time too some days. 11. Creative Writing... admittedly my boys are all quite adverse to writing but I can remember Alec making all sorts of wonderful stories and handmade books when he was in Kindergarten. He has a real knack for writing and I figure it can't hurt to suggest it now and then. I would even be willing to help them set up their own blog! 12. Film making. I figured if the boys enjoyed watching movies so much they might enjoy trying to make a movie or music video now and then. So many of our devices have an option to record and they have not really explored the idea the film making at all so this could be a lot of fun. 13. Playing an instrument. When the older two boys were little they did take music lessons. Ian learned to play the guitar and they both took piano lessons. Alec had wanted to continue learning the piano on his own using YouTube videos but have never bothered to take the time. Perhaps that is something he'd like to do now. 14. Puzzles. I try to set up family puzzles now and then and always encourage the boys to help me put it together. 15. Nature Study/ Hike. We don't have to go far to observe nature or find places to hike and knowing how much my boys would learn being out in nature I am always quick to suggest time outside to explore. 16. Volunteer work-- library, animal shelter, food bank, museum docents, etc. I've started looking around and keeping track of what ages my boys can start volunteering at various places. I would not force them to but I know Alec has shown interest a few times in helping out at the aquarium and the zoo. 17. Candy Making! Alec got a few candy molds and a candy pen for his birthday and all three boys have been asking about making chocolate candies. With the help of a few videos or books and some basic supplies this would make a great (and yummy!) hobby. 18. Starting their own business. This might sound a bit ambitious but even something as simple as putting together flyers offering to mow lawns or shovel snow for a bit of extra cash would be a great way for my boys to fill those afternoon hours! Selling handmade goods at craft fairs on through sites like Etsy might work too; you just never know. 19. Starting their own YouTube channel. My boys spent a lot of time watching YouTube videos and often talk with awe about the money some of these "YouTubers" make. I think it could be great fun and quite educational for them to see just how much work goes into it all. 20. Model Making. Ian used to enjoy putting toy models of trucks and vehicles together. There are many model kits to choose from and they come in such a wide variety of skill levels that this could make an excellent hobby! Thanks! I was trying to think of hobbies that might lead them into potential job fields. Thanks for this list! I have a few you may want to add to yours. Knot-tying (I bought my son a knot tying kit with two ropes and an instruction booklet) and stop-motion videos. My 11 year old enjoys those, as well as wood burning and drawing comic books. Oh and Lego of course. He also collects baseball and football cards. We have tried stop motion animation; surprised I didn't think of that one! We have never tried knot tying-- that sounds like fun. These all sound like fun! I think it is so important for anyone to have some hobbies. Very true; we should all have hobbies we enjoy no matter our age. Great ideas! Some of these I haven't tried with my daughters yet. Thanks for the inspiration! That's how I feel; my younger two boys would spend all day playing video games if I let them but there are so many wonderful ways to fill their time so I try to have them balance it all out. For screen time activities!! Thanks for sharing on Love to Learn blog hop. :) It's always neat to wonder... even when I thought I knew what my boys would be like in middle school they still managed to surprise me. So much variety! I love the breadth of opportunities your kids have, with such a great mix of arts and sciences all mixed in. Aw, thank you! I do try to keep things as varied as I can. The more things I can expose them to the more they'll know about. Gabbie likes photography and Zachary likes science. We like to do puzzles and volunteer together too! That is wonderful! I want to start volunteering with my boys; that is one area I feel we are really lacking in. Love these ideas! This age group especially needs activties and hobbies to fill their time and to help them explore possibilities. You never know where a hobby may lead! I confess to being easily distracted, and we can jump from one hobby to another at the blink of an eye. I'm working on challenging my kids to dig a bit deeper and devote more time so they can become better skilled. 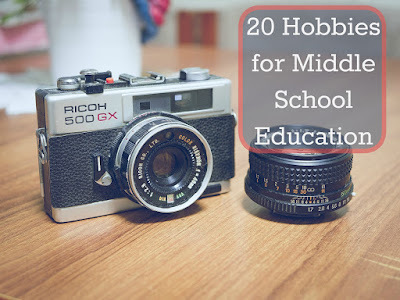 Thanks for the ideas - I'll be sharing this list with my children, see what they might choose! We tend to jump from hobby to hobby too and I often think we need to dig a bit deeper and challenge ourselves to get better. This is pretty dope. I'm looking for stuff for my little brother to do and I think this would make a great start. 'preciate it.